AVX Corporation, a leading manufacturer and supplier of advanced electronic components and interconnect, sensor, control, and antenna solutions, recently installed a 908kW solar energy parking canopy at its corporate headquarters in Fountain Inn, South Carolina. Consisting of 2,700 PV modules, the installation boasts a projected annual output of 1.3GWh of clean, green power, which is equivalent to the amount of power generated by more than one million pounds of burned coal. 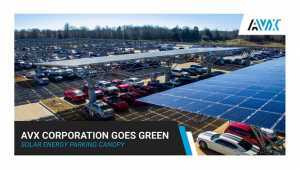 Comprised of 10 double cantilever monocrystalline architectural solar arrays that cover the employee parking lot, providing employees with a wealth of shady spaces protected from the scorching southern sunlight, the solar canopy is expected to generate nearly 150,00 kWh of electricity by the end of spring and approximately 1.3GWh by the end of 2019. The green energy will be used to subsidize the headquarters’ daily energy consumption and will also help mitigate the company’s electricity expenses by offering higher efficiency rates and more power output than polycrystalline solar panels.